Free yourself from the burden of selection. Let our Artisans send you a sampling of a random assortment of six-sided Druid’s Dice. This is the perfect way to enter the elevated realm of top-class gaming. Each tree species has its own story. Assorted Dice are a cost-effective way to sample the exotic wood varieties and expert Texan craftsmanship techniques behind each set of Druid’s Dice. I first found you on kickstarter, but after you had closed you funding requests. I would love to get some standard dice from you as a present for a friend of mine. Asorted is perfect but if you could find some flame/red/orange coloured ones i would be most indebted to you. Just show me where to sign. Also would you like me to post you webstie on my LARP and Magic the gathering forums or are you taking orders slowly at first? Glad you found the website! If you’d prefer warmer tones in your assorted set just mention that in the comments when you check out and I’ll try and make sure the dice tend toward to the red/orange/yellow end of the spectrum. And feel free to give us a shout out where ever you please. We’re taking orders everyday. There isn’t a checkout option on the assorted dice page. It also only seems to be on some of the wood options too. oops my apologies i forgot to tell the system they were in stock. got it fixed now. any chance of an assorted polyhedral set any time in the future? every now and then i have one. i’m putting up one tomorrow. On a similar note, what are the chances of seeing an assorted 10d10 set? How does the lead time on assorted dice differ from the lead time on cohesive sets? Will you be making assorted d10’s available now that you’re offering sets of them? 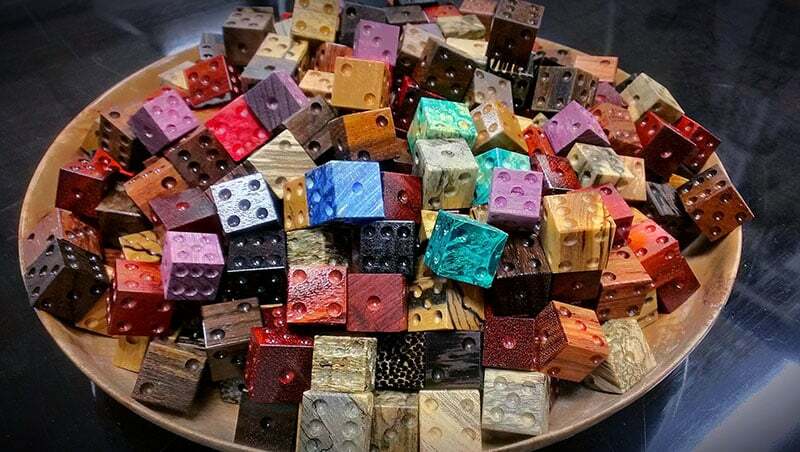 If we order a few sets of the d6 (family of BattleTech fans), would it be possible to get a list of what styles of wood the assorted dice are made from?? yes just make a note asking us to do so when you check out. What wood is the golden-coloured near the bottom-right, quite prominent? I’m looking for something like that in a full set of polyhedrals. Just to clarify, the one on top next to the purple. How much “request” do you take into consideration with the assorted pack? I’m really interested but can’t decide if I think the more subtle woods or vibrant dyed ones would look better in real life. Would it be reasonable to ask for half and half or does that defeat the purpose of the pack? I totally get it if this is the “what do we have left over?” deal. it has to do with shipping. the extra die adds just enough weight to bump the set to the next shipping bracket. Ah, I thought that might be the case. So those prices include shipping? Very good to know! I must have missed that info elsewhere. Just curious as to why these only come in d6’s. I would so love a ‘random’ 7 set of d4-d20. I just received the assorted 4d6 and they are amazing! They also come with a little box, very neat. My order was shipped a bit late, for I had to wait more than 6 months to receive the dice. But the fast response on my mails and the fact that I got an extra druid d20(!!!) made it worth the wait. I definitely going show of my new dice to my dnd group! Hi there. What is the latest I can order the 6D6 random set and get it by XMas this year? honestly the sooner the better. we usually keep the assorted dice on hand, but we will run low on just about everything during the holidays. we will have more info on holiday order deadlines posted in november. sorry bug in our system. just fixed it. should be good to go now.